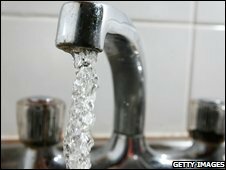 Household water bills will rise by an average of 4.1% in England and Wales in the year from April, the regulator Ofwat has announced. The amount, which is above the current inflation rate of 3%, is an average increase of £13 per home to £342. Customers of Mid Kent Water will see the biggest rise - up 7.9%, or £13, for water services alone. But customers of Bournemouth and West Hampshire Water will see prices come down slightly, the figures show. The regulator sets limits on the prices water and sewerage companies can charge. New limits from the five years from 2010 will be set in November. Customers will shortly receive their bills which come into effect from 1 April. The average bill includes nearly £163 for water services and just under £180 for sewerage services, and Ofwat said that £1bn was being invested in 2010-15 to cut the number of homes at risk of flooding from overloaded sewers. The price limits for 2009-10 rises were set in 2004. Ofwat chief executive Regina Finn said investment was increasing the quality of drinking water, beaches and rivers. "Further investment was vital, but we needed to strike a balance with keeping bills down. Our work has kept customers' bills around £100 lower than they would otherwise have been," she said. "No-one wants to see bills increasing, particularly in tough economic times. Yet over the last 20 years we have made sure that this essential investment has delivered very real benefits for us all." Water bills depend on each householders' supplier and whether or not they have a water meter. About 600,000 people served by Mid Kent Water, which has now merged with South East Water, will see the biggest rise. The company said it would have invested nearly £300m into its pipe network, pumping stations and treatment works since 2005, with another £60 million planned spending in 2009 and 2010. Ofwat is currently examining proposals from water companies for the next big round of price agreements. They want the average bill to rise by 9% more than inflation between 2010-2015. Mrs Finn said they were determined to make sure customers got a "fair deal". Watchdog the Consumer Council for Water said it had asked the government to provide more help to customers struggling to pay their water bills through the tax and benefits system. "Any price increase will be a concern for customers in the current economic climate and we recognise many customers may struggle to keep up with these bill rises," said Dame Yve Buckland, the watchdog's head. She added that the watchdog was working with the government on a review of water charging and affordability.